The Vespa PX becomes a real work of art, moulded and shaped by Mino Trafeli’s creativity. A precious anthological exhibition of Trafeli’s works is hosted in the halls of the Piaggio Museum in 2003. “Mitologica Vespa” (“Mythological Vespa”) was donated to the museum’s collection by its author, and was defined as follows: “A parallel game that distorts the object in order to create a new shape, using unsuitable materials thus giving birth to new considerations on the object itself. 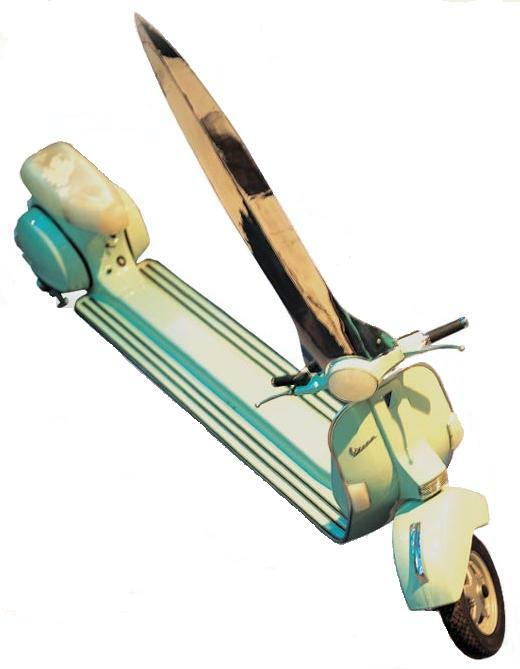 Re-considering, beside the visual inertia that leads to the shapes’ inurement, the scooter aesthetical valence, and re-discovering the meaning of its unique style which has maintained its original characteristical form, despite the changes of time".